The IA Design team worked closely with family-grown construction giant, Buildcorp, to deliver a highly sustainable office environment that exemplified their company values and brand. 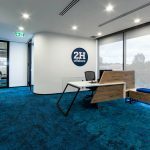 Drawing inspiration from Builcorp’s long family history, quality industry reputation and innovative work culture, the IA Design team developed a unique environment for the Brisbane headquarters. The space is full of personality and character, designed to provide clients and employees with an authentic and flexible work environment. 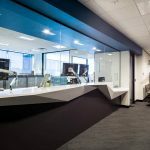 The workspace takes a bold move away from a traditional corporate working environment, with a dark colour palette and strong timber veneers to create an intimate, moody atmosphere. Breakout zones and meeting areas are focal points of the new space, successfully maximizing staff communication and collaboration, as well as increasing workplace flexibility. The success of the project was facilitated by ongoing communication with site managers and key internal stakeholders, which resulted in cost savings, timely project delivery and an extraordinary new work environment.